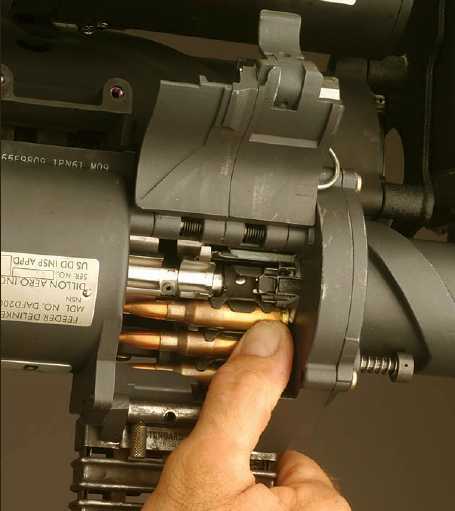 0.30" (7.62 mm) M134D Gatling Gun. Photograph copyrighted by Dillon Aero, Inc.. Developed by General Electric in the early 1960s, the "Vulcan" series of miniguns is available in many calibers from 5.56 mm (0.223 in) up to 25 mm (1.0 in). The 0.30 caliber (7.62 mm) GAU-2 version was first deployed by the Air Force for use on light aircraft and helicopters, but has since been adopted by the Army, Marines and Navy for the same purposes. These guns are widely used, with the U.S. Army alone purchasing over 9,500 M134 guns. 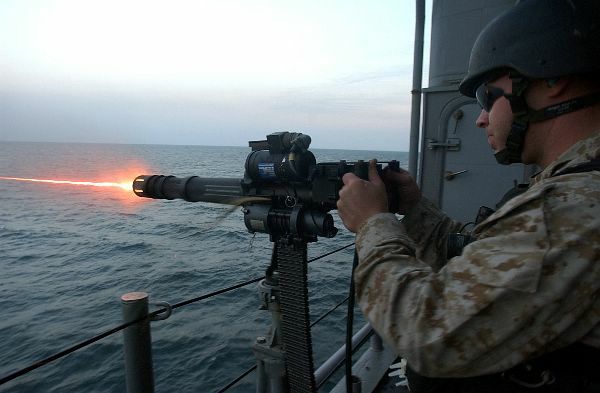 In the last few years, the Navy has started using these weapons on ships to supplement the 25 mm Chain Gun and venerable 0.50 in "Ma Deuce" M2 BMG. The term "Vulcan" was originally the GE Project Name for the first Gatling-type electric-powered minigun and is now a slang term for all of these electric Gatling guns. The GAU-17/A gun system consist of a six-barrel rotary gun, a gun control assembly with electrical cables, gun drive motor unit, a delinking feeder, flexible ammunition feed chutes and an ammunition storage system. Gun component parts, such as the rotor, housing, feeder/delinker, and barrel clamp/flash suppressor, are available in either steel or lightweight titanium. Quoting from a USMC HMLA OAG Action Item: "The GAU-17 minigun, while providing [an] outstanding volume of fire, is notorious for jamming." Most of the problems occur in the Feeder/Delinker assembly. One manufacturer of this weapon, Dillon Aero, Inc., claims its Feeder/Delinker design is much more reliable with an average of 30,000 rounds between stoppages. This weapon is also used on surface warships in the British Royal Navy. Barrel cluster rotates counterclockwise as viewed from the breech end. M134D is the minigun itself. Other designations are usually for the "gun assemblies" that include the mounting. The GAUSE designation appears only on text released with U.S. Navy photographs. It may represent a "sailor-alt" rather than an official U.S. Navy designation, although I have been unable to confirm that one way or the other. I have been told by USN personnel that the "SE" in GAUSE probably stands for "Shipboard Equipment" and refers to the entire gun and mounting assembly rather than to just the minigun itself. The original design of the 1960s had a fixed rate of about 6,000 rounds per minute. This was unsustainable over any period of time and the weapon was redesigned to add a transmission housing at the motor, giving the weapon a variable speed of 2,000 or 4,000 rounds per minute. 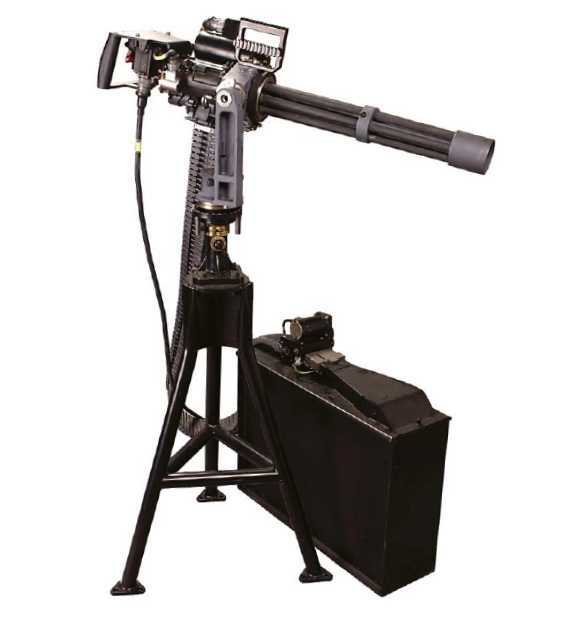 On the newer Dillon Aero Inc. version, the rate of fire is determined by the gun drive unit used, with drive units giving either 3,000 or 4,000 rounds per minute available. There is no speed selection on this version other than by assembling a different gun drive motor to the the gun system assembly. The 3,000 ROF drive motor takes 0.5 seconds to spin up to speed and 0.25 seconds to spin down to stop. When the trigger is released, there is a delay until all six barrels have been cleared by fire. This ensures that no live ammunition is left in the firing chambers, thus eliminating cook-off problems. These guns use standard NATO 7.62 mm percussion primed ammunition which is usually supplied in in 1,000 round disintegrating-link belts. Unit requires 24 - 28 Vdc, 58 amps to operate. Vac power supply option is also available. 0.30" (7.62 mm) Minigun on Mark 16 Naval Post Mounting. Photograph copyrighted by Dillon Aero, Inc..
GAU-17/A Gatling Gun on USS Philippine Sea CG-58 in February 2004. U.S. Navy Photograph 040201-N-0331L-013. 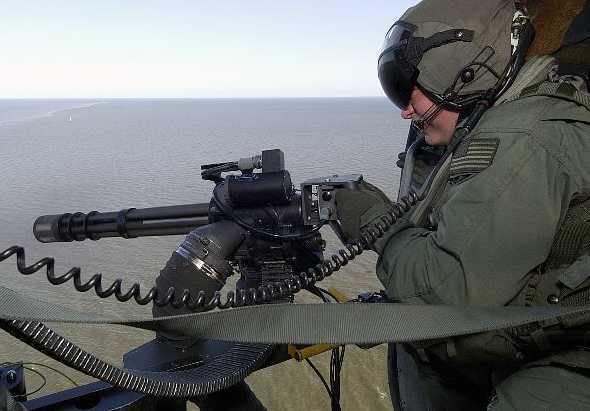 GAU-17/A on HH-60H Seahawk helicopter in April 2004. U.S. Navy Photograph 040422-N-4374S-006. GAU-17/A on HH-60H Seahawk helicopter in April 2004. U.S. Navy Photograph 040422-N-4374S-002. 0.30" (7.62 mm) Minigun on HMS Southampton with HMS Invincible in the background. This weapon is actually misidentified as a "20mm gun" on the Royal Navy Website. Note the Phalanx mounting in the upper left corner. Royal Navy Photograph No. 1098783594. U.S. Army M134. U.S. Army Photograph. DAFD2000-1 Feeder/Delinker. 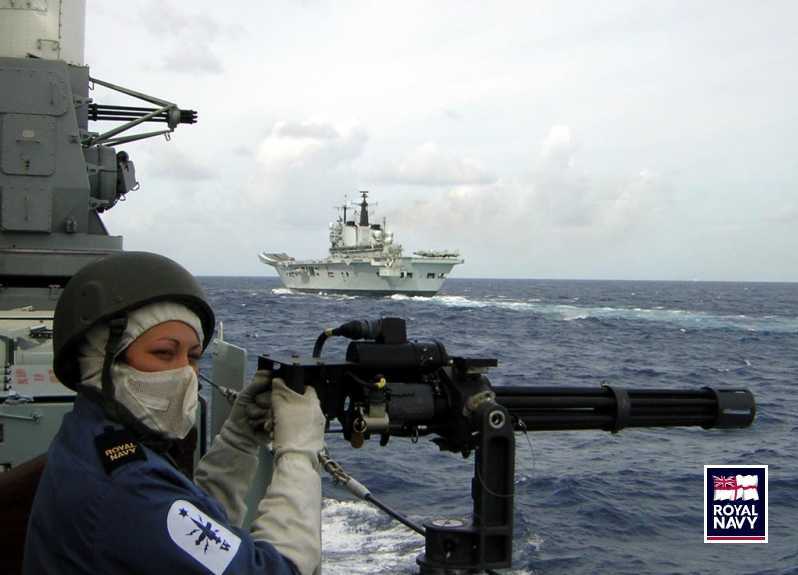 Photograph copyrighted by Dillon Aero, Inc..
0.30" (7.62 mm) Minigun on an unidentified British Royal Navy Warship. 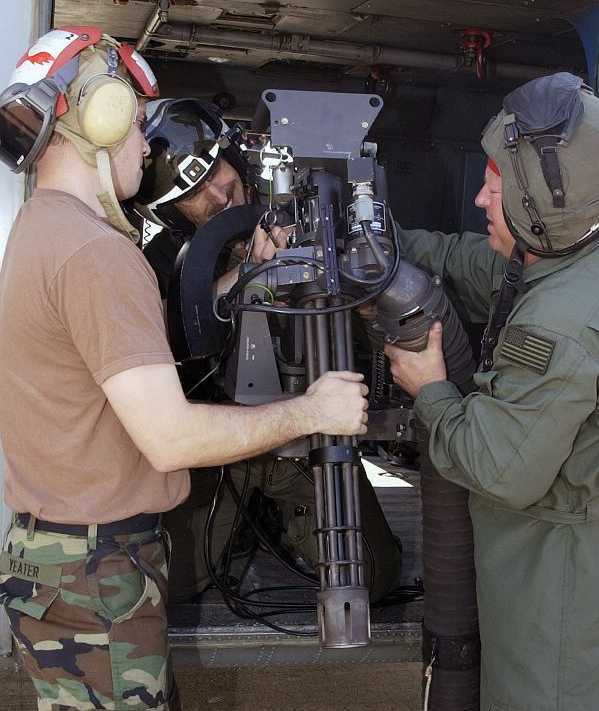 Royal Navy Photograph courtesy of Dillon Aero, Inc..
"M134D Minigun Product Information Guide" by Dillon Aero, Inc.